The Environmental Art Symposium “Nine Dragon Heads”, was initiated in South Korea by Park, Byoung-Uk in response to the destruction of an important historical site in 1995, and has evolved from the original specific eco-political motivation into an open interdisciplinary platform where an association of artists from all over the world implement individual and collaborative art projects related to humanitarian, political, environmental and cultural issues. The emergence of the environmental art initiative Nine Dragon Heads was inspired by concern over the natural, cultural, historical and archaeological landscape of South Korea and coincided with a period of industrial rise and profound political change. Arising in the context of economic and infrastructural development, South Korea was a country actively positioning itself on the global socio-political, educational, artistic and cultural scene. The origins of Nine Dragon Heads are part of a distinct continuum of artistic development in Korea, beginning in the 1980’s and 90’s with a small group of artists (contemporaries of Mr Park, Byoung-Uk) who wanted to consider artistic and philosophical problems outside of traditional Korean art forms and who were motivated to remain under the radar of the military regime and government control in place at that time. In that political environment a significant thread of South Korea’s contemporary art development took place in off-site projects, held within rural mountainous areas and remote natural sites. Examples of other artistic projects that evolved out of the activity of this early group are the Baggart Art project and the Gwangju Biennale, both of which still operate in outdoor symposia formats after thirty years of activity. Nine Dragon Heads has an historic social and collegial connection to these histories but is distinct in its specific ethical motivation. During twenty years of activity Nine Dragon Heads has evolved out of specifically formative geo-political and art historical backdrops to investigate a broader range of transitional environmental, economic and political situations. A further important evolution for Nine Dragon Heads, which separates the thread of its concerns from other contemporary site related projects in Korea began in 2006 when the project became actively nomadic. The large number of international artists who attended Nine Dragon Heads events through its formative years continually confronted the project with the kinds of conceptual considerations that arise in international conversations about the globalization of art practice and politics of locality. It was a natural progression for the project to begin to engage with other specific localities and their eco-political histories by traveling. Working in locations with transitional characteristics that may be environmentally, economically and/or politically troubled, on important cultural, historical and geopolitical routes has become a particular feature of working within Nine Dragon Heads. It is noteworthy that Nine Dragon Heads is an inherently flexible model capable of responding perceptively and with focused spontaneity to the inevitably unexpected contextual conditions which occur within the immediate surroundings of each location the group is engaging with artistically. Nine Dragon Heads has worked on locations on the South Korean Peninsula and its islands, including the Demilitarized Zone (DMZ) and Joint Security Area (JSA) between the North and South of Korea. Other areas recently engaged include Bosnia/Herzegovina, the South Caucasus; Georgia, and Central Asian locations; Uzbekistan, Turkey, China, Tibet and Mongolia. Past projects have also taken place in Switzerland, Australia and New Zealand. Nine Dragon Heads latest projects include “Jump into the Unknown” presented within the Official Collateral Events program of the 56th la Bienalle di Venezia. 2017 – “Taste of Tea”, parallel project of the 15th Istanbul Biennale. 2017 – “Taste of Tea”, workshop, Istanbul, Bursa, Turkey. 2016 – “Taste of Tea”, workshop, Busan, Korea. 2016 – SEEAF2016, Suncheon Bay International Eco-environmental Art Festival, Korea. 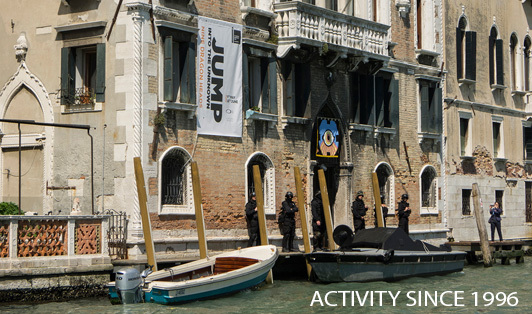 2015 – “Jump into the Unknown”, official Collateral Events, 56th la Biennale di Venezia. 2015 – Daesan Environment Art Project, Daesan Art Museum, Suwon, Kyeongnam and Changwon, Korea. 2014 – “Twist to Exist” Collegium Artisticum, City Gallery Sarajevo, Sarajevo Winter Festival, Bosnia. 2014 – Nine Dragon Heads 20th Year Anniversary, 19th International Environmental Art Symposium and Workshop, “Jump into the Unknown”, Venice Lagoon – Murano, Lido, Pellestrina. 2013 – 18th International Environmental Art Symposium, “Nomadic Party #3” ‘Ger to Ger’, Mongolian National Modern Art Gallery, Gobi Desert – Khuvsgol, ARKO – Art Council Korea, Jeju Island. 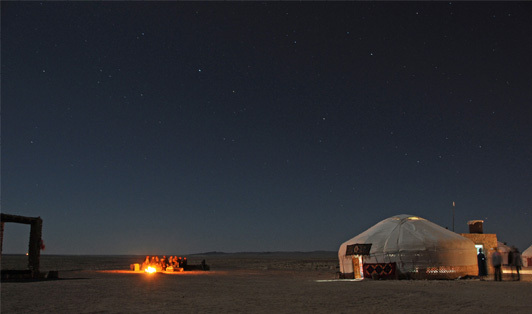 2012 – 17th International Environmental Art Symposium, “Nomadic Party #2”, Istanbul, sites in Uzbekistan including Samarkand and the Aral sea, final exhibition in association with ‘Artisterium V’, Tbilisi, Republic of Georgia. 2011 – “3 Paws”, Biel/Bienne, Switzerland. 2011 – 16th International Environmental Art Symposium, “Chamagodo”, public space at the following sites : Jade Dragon Mountains, Sang-Kyodujin, Tiger Leaping Gorge, Yan Jing, Mangkang, Zogang, China, Rawu Lake, Poumi, Lhasa, Tibet, Potala Palace, Jo Kang Temple, Sera Temple, Himalaya Base Camp, Kodari, Kathmandu, Final event at the Nepal National Musem. 2010 – 15th International Environmental Art Symposium, “Nomadic Party #1”, Opened with exhibition and performances at Arko Art Center and Marronnier Park (Seoul), touring in China and working in public at the following sites along the Silk Road: Dunhuang, Taklamakan Desert, Gobi Desert, Tian Shan Mountains, returning to Korea for a final reprisal and re editing of exhibition at the Arko Art Center, Seoul, Korea. 2010 – NDH at the Turkish Cultural Center, Sarajevo Winter Festival, Bosnia. 2009 – 14th International Environmental Art Symposium, “Island”, Jeju Island, Haeundae Beach, Gallery Art Seoul, South Korea. 2009 – “Organic Art Life”, Turkish Cultural Center, Sarajevo Winter Festival, Bosnia. 2008 – 13th International Environmental Art Symposium, “Encumbered Bush Walk”, Jeju Island, Cheongju Artist Residency center, South Korea. 2008 – “Barricades without Borders – New (Brave) World”, Turkish Cultural Center, Sarajevo Winter Festival, Bosnia. 2007 – 12th International Environmental Art Symposium, “Island, Come Ashore”, Cheongju Art Center, Geoje Art Center, Sunyoudo Island. GeoJedo Island, South Korea. 2007 – NDH, Turkish Cultural Center, Sarajevo Winter Festival, Bosnia. 2006 – 11th International Environmental Art Symposium, DMZ & JSA / Demilitarized Zone and Joint Security Area, the border between North Korea and South Korea. 2006 – Nine Dragon Heads at the Sarajevo Winter Festival, Turkish Cultural Center. 2006 – Meeting Downhill, Quartair Gallery Den Hague, Holland. 2005 – “Far Near Neighbors”, NDH, Novi HramGalerija, Sarajevo Winter Festival, Bosnia. 2005 – Dawn Light Symposium, Gosford City Gallery, New Castle University, Australia. 2005 – Terminus Project, in association with Nelson Festival of the arts and Hocken Gallery, Nelson Haulashore Island and Dunedin Harbor, New Zealand. 1996-2005 – annual iteration of “Nine Dragon Heads International Environmental Art Symposium”, Culture Park, Daecheong-Lake, Cheong Ju Art Center, South Korea.